Product prices and availability are accurate as of 2019-04-10 09:24:13 EDT and are subject to change. Any price and availability information displayed on http://www.amazon.com/ at the time of purchase will apply to the purchase of this product. Thirsties Duo wraps are here to help stop leaks! 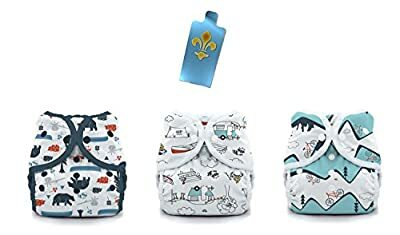 These pliable and breathable wraps provide an ultra-comfortable waterproof cover for fitted, prefold, and flat diapers while remaining waterproof. They have a trim fit and leg gussets for advanced leak protection. Best of all, they grow with your baby so you'll only need two sizes from birth to potty training! The inside of Duo Wraps can be wiped clean between uses which allows for fewer wraps in rotation and greater affordability. This is a 3 pack of Size 2 wraps with the colors/prints as shown in the photo. Thirsties Duo Wraps are a very trim fitting cover. They are the preferred wrap for trifolded prefold diapers and over trim fitted diapers, such as their Fab Fitted diapers (not included). 1 Oz laundry soap included.